Whisky Poker - thanoscardgamess jimdo page! 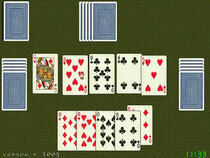 In this card game from the US, the objective is to collect the best 5-card poker hand, by exchanging cards with a spare hand dealt to the table. Each hand dealt has five cards. When the spare hand is face up on the table, at your turn you have the option to exchange one card (you discard one card from your hand face up to the table and take a card from the spare hand in exchange for it), the option to exchange five cards (you discard your whole hand face up and take the whole spare hand in exchange for it) or to knock (you keep your cards and signal that the play will end before your next turn). The play continues until someone knocks. The other players then have one more turn. When the turn reaches the (first) player who knocked, everyone shows their cards.When the hands are shown, the player who has the best hand (according to the standard ranking of poker hands) takes all the chips from the pool.